HAMPTON SUN SPF 15 SUPER HYDRATING FACE CREAM not only offers the ultimate in protection from the sun's harmful UVA and UVB rays, but also helps your skin look its absolute best. The formula's amazing ingredients also reduce puffiness/redness and promote anti-aging by minimizing fine lines on the face. 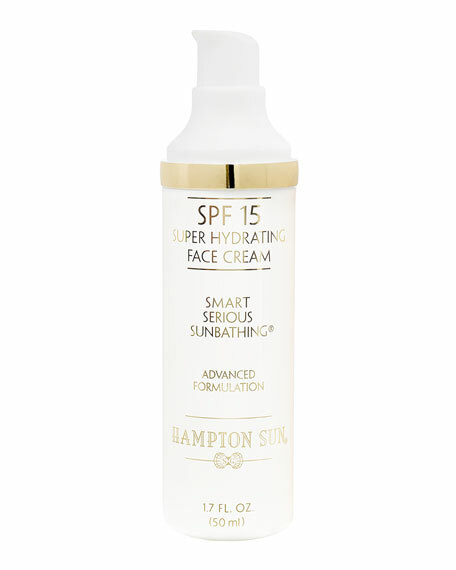 Hampton Sun's SPF 15 Super Hydrating Face Cream is dermatologically tested, hypoallergenic, fragrance-free and oil-free. This hydrating cream is perfect to wear under makeup or solo  making it easy to look fabulous while protecting skin from dangerous environmental stressors.